Eating, by itself, is one of the biggest attractions at Epcot. 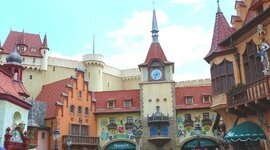 There are 11 different nations in the World Showcase, each with their own restaurants and food stands. You get to try a huge variety of ethnic cuisine, many of which you don’t always come across back home. 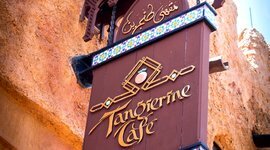 Dining at Epcot restaurants that offer counter service lets you sample the flavors of the world, without having to dish out serious cash or secure tough reservations at table service restaurants. Plus it’s best to try a lot of little dishes here and get a taste for everything, than splurging on one big meal. 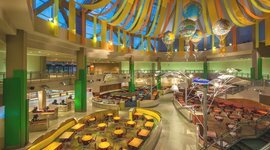 It’s the “food court” of Epcot. 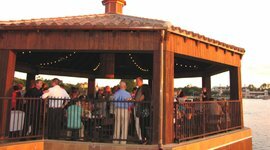 You’ll find several different stations offering food ranging from Asian stir fry, rotisserie chicken, roasted pork chop, grilled salmon, fish tacos, sandwiches, salads, and soups. This is the place to go if you have a large group, because everyone’s bound to find something they like. If you have a sweet tooth, the dessert selection here is quite extensive, to say the least. Often times, it’s hard to choose! This place is also open for breakfast, where you can grab pastries, breakfast sandwiches, and other items before your trip around the world. As with the Main Street Bakery in Magic Kingdom, this is where you get your Starbucks fix, with the usual coffee, tea, pastries, and sandwiches. They serve sandwiches, flatbreads, and tossed salads. And while, the French dip and the Sausage and Peppers sandwiches are the crowd favorites, the Veggie Naan Wich is surprisingly good, and a healthy alternative. For the adults, the beer and sangria here are soothing and refreshing. 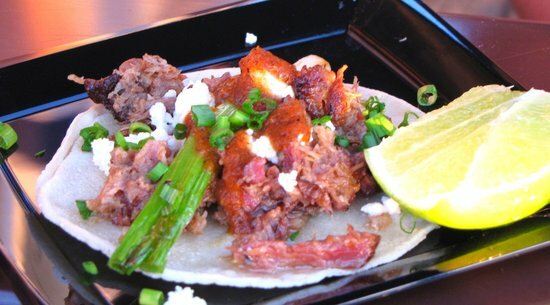 Their tacos are surprising authentic, with slow-cooked carne asada and the traditional, stewed Chicken Tinga. You can taste the care that they put into not making it any old Mexican-American restaurant. But the big draw here is that you get to sit right on the lagoon. It’s a relaxing way to enjoy your lunch in the shade. If it’s too hot, they also have an often overlooked, indoor seating area. 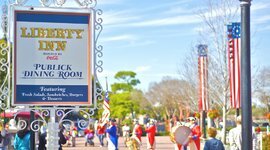 Most guests miss the entrance because the doors are usually closed. Look for large double doors just to the right of where you ordered your food. 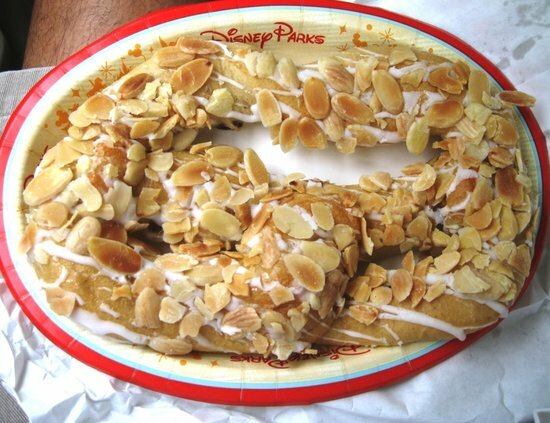 It’s all about the sweet pretzel, covered in glossy sugar icing and chopped almonds. 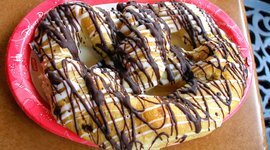 On a chilly winter night, there’s nothing better than a warm cup of coffee and this decadent pretzel. 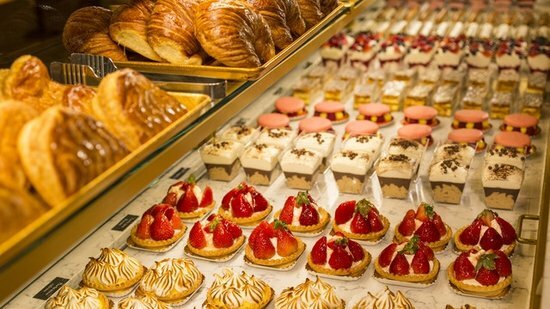 You can find a number of delicious pastries at this Norwegian bakery. Try the School Bread and Troll Horn! They also serve sandwiches. On a hot summer day, the smoked salmon and egg sandwich is a great, lighter alternative. You’ll be dreaming of a cooling breeze over the icy rivers of a Norwegian Fjord. 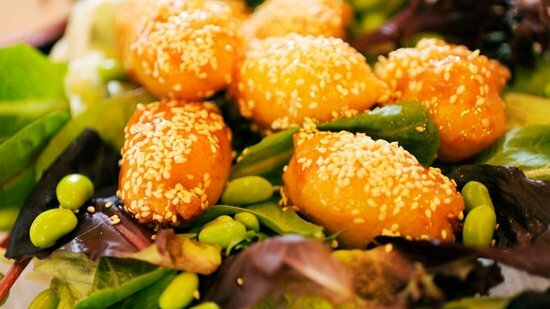 Located in the China pavilion, it’s classic, soul-satisfying American-Chinese food. Expect all the typical spring rolls, Chow Mein, and Mongolian Beef. On cold nights though, the Beef Noodle Soup bowl hits the spot every single time. 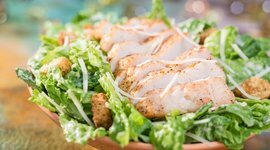 The Sesame Chicken Salad is a rather good, healthy alternative. There’s no shame in settling for a hotdog, when they call it a frankfurter. This Epcot restaurant in the Germany Pavilion is all about sausage, from bratwurst and frankfurter to the spice-laden currywurst. The house-made paprika chips are the perfect compliment to your mug, brimming with frothy German beer. Located in the America pavilion, one would expect your typical burgers and fries. But look again. It’s a tribute to American specialties from across the country. Splurge on the New York strip steak or the Louisiana shrimp and rice. Or, get their version of the famous Maryland crab cakes. This counter service also happens to have a limited selection of kosher items on the menu, consisting of chicken tenders, hot dog, and burgers accompanied by yummy potato croquettes. They need to sell those croquettes as a side dish by themselves! Katsura Grill is a good introduction to Japanese food. 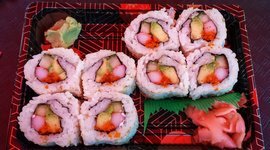 They have sushi rolls, udon noodles, teriyaki, rice dishes, and combo meals. My favorite is the Chicken Cutlet Curry, the Japanese version of beef curry sauce, poured over the Japanese version of fried chicken. If you prefer a healthier option, the Teriyaki Salmon served with steamed rice and vegetables is an excellent choice. And once again, when the weather is on the chillier side, the bowls of udon noodles are extremely comforting and satisfying. This is a refreshment stand right out front at the Japan pavilion. 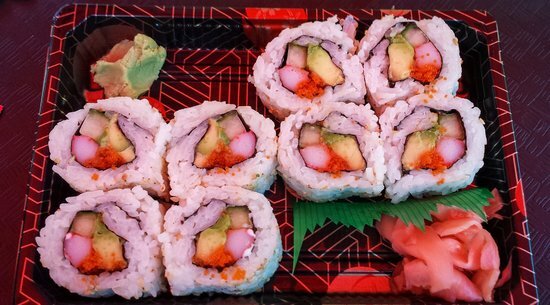 They serve small sushi rolls as a snack, but it’s really all about two things here. The alcoholic beverages, include hot and cold sake, beers, and plum wine for those with adventurous palates. And then there’s the legendary Kakigori. 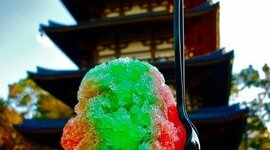 This might just be one of the best frozen treats in all of Disney World. When the weather is hot and humid, there’s nothing better than this powder-fine, shave ice delicacy. It comes in a number of flavors, but I’d highly recommend getting the rainbow flavor (a combination of all of them). Pay the extra $1 to top it with sweetened condensed milk. Trust me! Find a nice shaded spot and enjoy your Kakigori, much to the envy of everyone who passes you by. 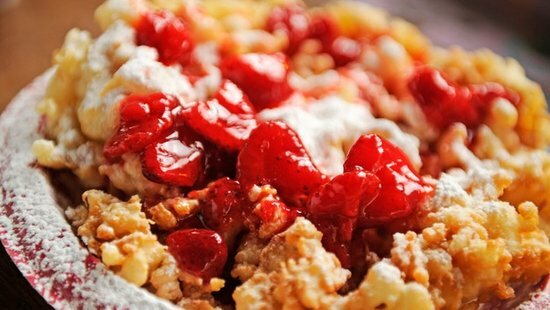 If you consider funnel cake as a valid food group, then you’ve just found your happy place. Technically located within the America pavilion, this food stand is in between America and Japan. It has a variety of funnel cakes to satisfy your cravings. The Pumpkin Spice funnel cake is quite good and (most importantly) very American! It’s a light, yet satisfying introduction to Mediterranean and Middle Eastern food. 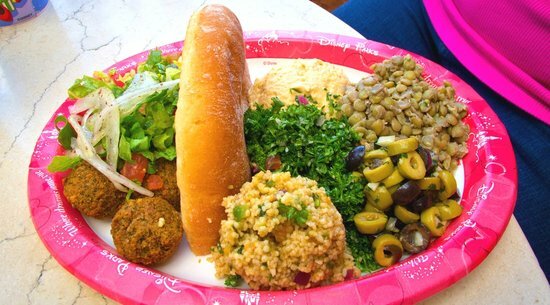 Located in the Morocco pavilion you’ll find everything from hummus to shwarma. The platters give you a nice variety of different dishes in one, definitely the way to go if you’re looking for a good sampling. Note however that the “lamb” items are actually gyro meat, not lamb chops or anything like that. They also have a larger and tasty selection of vegetarian items. In fact, the vegetarian platter is my favorite menu item here, even though I am not a vegetarian. It’s the perfect lunch during a hot day. For a drink, check if they have that uber-refreshing mint iced tea. It’s a French bakery out of the heart of Paris. You could skip right to dessert without any regrets at this Epcot restaurant. Their pastries and multi-colored macaroons are to die for. There’s a wide variety to choose from and you may have to make several trips to truly satisfy your cravings. Entrees ranges from sandwiches to salads. 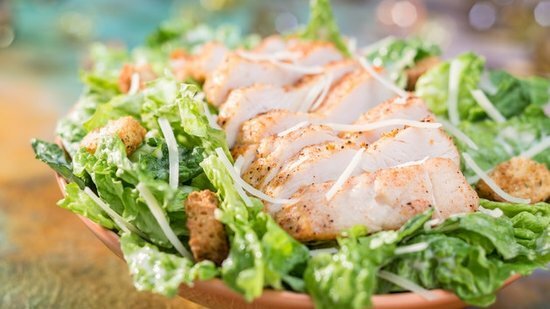 Popular items include the Poulet au Pistou, or chicken with pesto, and the open-faced sandwiches. And, what French restaurant would be complete without wine? So order a glass if it’s a spot of vino you crave. 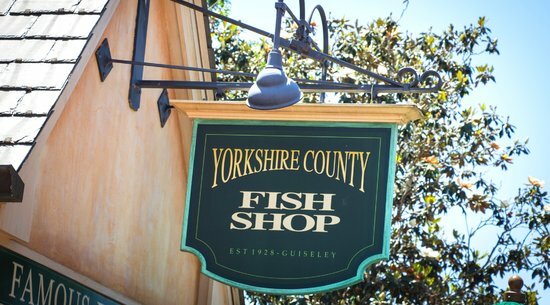 What’s the one dish you’d expect to find in the United Kingdom Pavilion? Fish and Chips, of course. It’s probably one of the simplest dishes on Earth – breaded and fried white fish with fried potatoes, dipped in a ranch and pickle-relish sauce (tartar sauce). But it hits the spot, especially if you’ve made it all the way to the UK Pavilion from the other side without anything to eat. 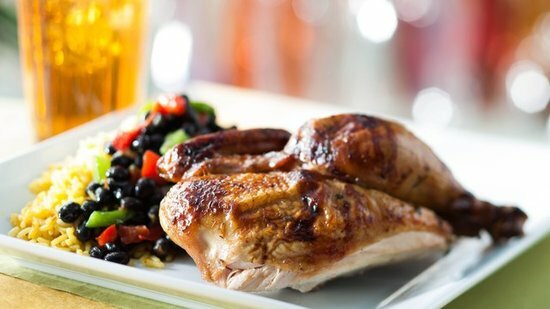 For the adults, you can order a hearty English Ale or Lager to go along with your meal. 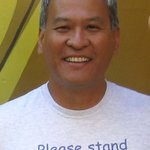 Zeke is a physicist, living near Chicago, and a huge fan of the Disney parks. 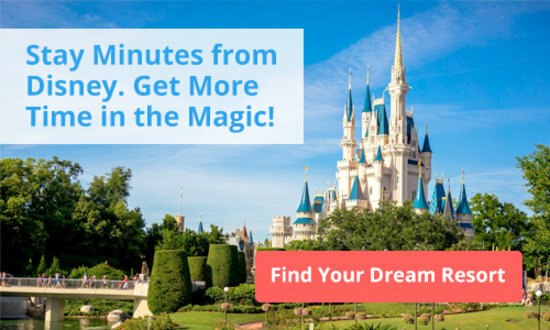 Having discovered Walt Disney World as an adult, he makes 2-3 trips a year to the Most Magical Place on Earth. He’s also an avid foodie and lover of down-home ethnic cuisine. 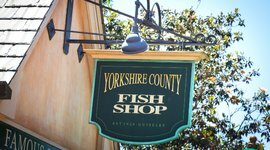 When you're hungry in Future World on a hot day this is the spot. There's lots of seating, the crowds are smaller, and the A/C is on full blast. Grab a quick and satisfying meal of fish and chips, and wash it down with a refreshing British beer or soda. They have some tasty shortbread cookies too. It's light, refreshing, and tasty all at the same time, perfect for a hot day. They serve hummus wraps, shawarma, and a large selection of vegetarian options. The best place to cool down and recharge in Epcot. 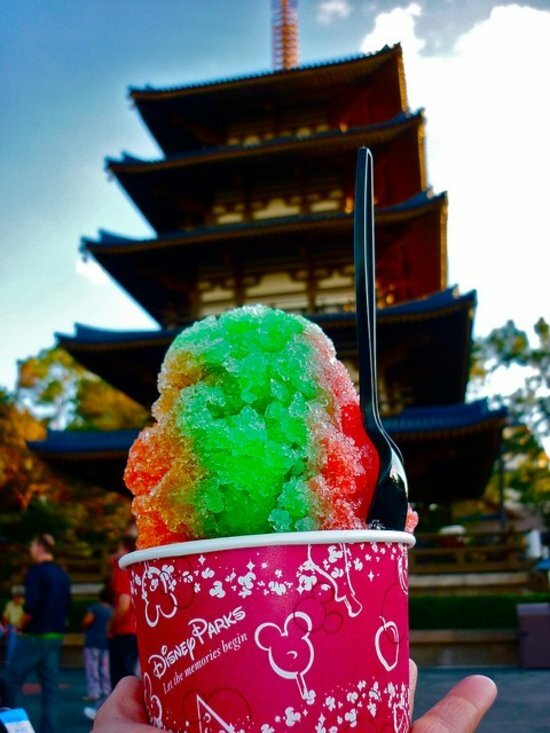 Grab a sushi snack, or a beer, sake, or plum wine, and the legendary Kakigori shave ice. 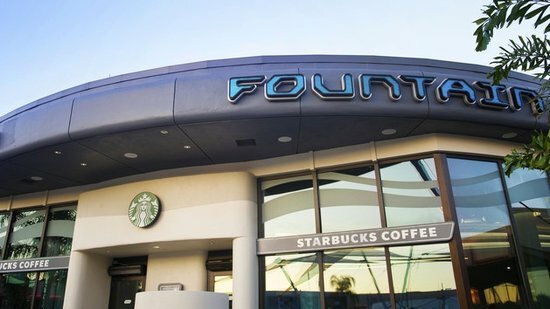 It could be your first stop of the day or a well-deserved pick me up in the afternoon. They're known for their French dip sandwich and one with sausage and peppers. There's also a nice selection of sandwiches, flatbreads, and salads. Their tacos are actually pretty darn good, and you can't beat the lakeside view in the shade. The winners here are the pretzels drizzled in icing and some seriously tasty Norwegian pastries. Their smoked salmon sandwich is quite delicious too. This is your spot for sesame chicken, spring rolls, and other sweet and sour comforts. On cold winter days, the Beef Noodle Soup really hits the spot. There's no shame in settling for a hot dog when you're in Germany. They've got brats, franks, currywurst, and lots of German beer. It's not your typical burger and fries. It's New York strip steak, Louisiana shrimp and rice, and those famous Maryland crab cakes. They've got teriyaki, udon noodles and the always tasty Chicken Cutlet Curry. It's a great intro to Japanese food, hot and raw.